The EPSL paper “Slow strain release along the eastern Marmara region offshore Istanbul in conjunction with enhanced local seismic moment release” received a significant attention worldwide. While updating my publication record, I came across a nice website altmetric.com which provides a cool blog-style overview of this paper impact in public space. I co-authored paper in Geophysical Journal International by Hannes Hofmann discussing the cyclic soft stimulation campaign performed in August 2017 at Pohang EGS system. The paper is available to download from journal website. The analysis performed by Hannes was a part of activities performed within DESTRESS DEmonstration of Soft Stimulations Treatments of Geothermal Reservoirs project. Hofmann, H. et al. (2019). First field application of cyclic soft stimulation at the Pohang Enhanced Geothermal System site in Korea, Geophys. J. Int. 217, no. 2, 926–949, doi 10.1093/gji/ggz058. Large-magnitude fluid-injection induced seismic events are a potential risk for geothermal energy developments worldwide. One potential risk mitigation measure is the application of cyclic injection schemes. After validation at small (laboratory) and meso (mine) scale, the concept has now been applied for the first time at field scale at the Pohang Enhanced Geothermal System (EGS) site in Korea.From 7 August until 14 August 2017 a total of 1756 m³ of surface water was injected into Pohang well PX-1 at flow rates between 1 and 10 l s–1, with a maximum wellhead pressure (WHP) of 22.8 MPa, according to a site-specific cyclic soft stimulation schedule and traffic light system. A total of 52 induced microearthquakes were detected in real-time during and shortly after the injection, the largest of Mw 1.9. After that event a total of 1771 m³ of water was produced back from the well over roughly 1 month, during which time no larger-magnitude seismic event was observed. The hydraulic data set exhibits pressure-dependent injectivity increase with fracture opening between 15 and 17 MPa WHP, but no significant permanent transmissivity increase was observed.The maximum magnitude of the induced seismicity during the stimulation period was below the target threshold of Mw 2.0 and additional knowledge about the stimulated reservoir was gained. Additionally, the technical feasibility of cyclic injection at field scale was evaluated. The major factors that limited the maximum earthquake magnitude are believed to be: limiting the injected net fluid volume, flowback after the occurrence of the largest induced seismic event, using a cyclic injection scheme, the application of a traffic light system, and including a priori information from previous investigations and operations in the treatment design. We analyze source characteristics of picoseismicity (moment magnitudes smaller than -3.5!) 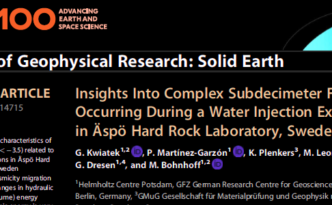 related to hydraulic stimulations in Äspö Hard Rock Laboratory, Sweden. We show that spatio-temporal seismicity migration is controlled by changes in hydraulic (pressure times volume) energy. We present that total radiated seismic energy is very low with respect to injected volume, and increases with hydraulic energy rate.